Okay, here's a confession. I never really loved Kandinsky's paintings. Don't get me wrong. I appreciate Kandinsky very much as an artistic innovator and even as an author--his book on the spiritual in art has been an inspiration. But many of the paintings for which he is most famous don't work for me. There are, however, exceptions. I'm drawn the the works that book-end his illustrious career. His earliest experiments with abstraction between 1909 and 1912, and some of the biomorphic Bauhaus pieces and work he produced in France after the Bauhaus was closed. A current show at the Royal Museum of Fine Art in Brussels, surveys the early effort, to considerable effect. With many pictures borrowed from St. Petersburg's Russian Museum, and other collections, the show give Western European art audiences a look at some paintings that helped establish Kandinsky as a major pioneer of the avant garde. 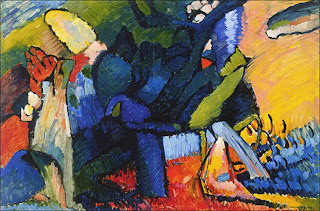 The show also allows viewers to see how Kandisky's abstract works emerged from earlier efforts. 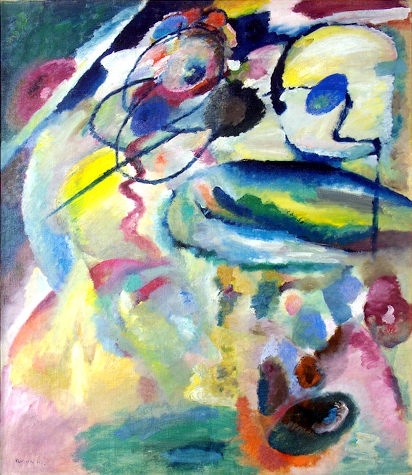 The thesis of the Brussels exhibition is implicit in the title, Kandinsky in Russia. Kandinsky's aesthetic is deeply informed, viewers are instructed, by his emersion is Russian culture. Icons, woven belts, and wooden doors are among the artifacts presented along side the artist's early efforts. There are also numerous folk prints, showing scenes from legend and lore. 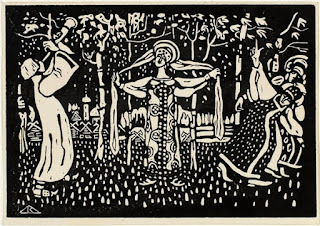 The case for the influence of these latter objects is easily made, for Kandinsky himself made folk woodcut prints before venturing into modernist painting. The example above illustrates. It also has elements recognizable in the artist's mature work: abstract patterns, musical lyricism, and a composition that is busy and detailed throughout. 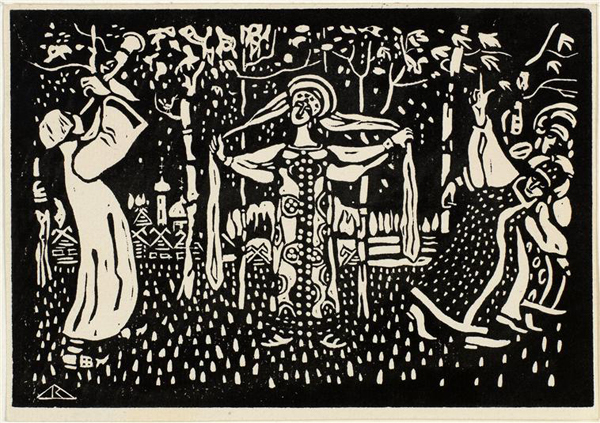 From these folk images, it is not hard to see how Kandinsky evolved towards his distinctive style. The exhibition helps to trace the progression. 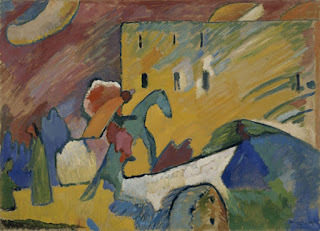 The image above is a folk scene, to be sure, but we see Kandinsky adopting a vivid pallet and reducing his figures to their underlying geometrical form. The transition was fueled, no doubt, by Kandinsky's exposure to international art. 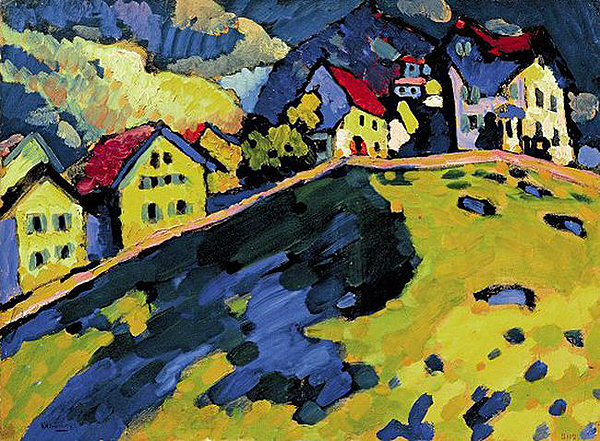 In the latter part of the century's first decade, Kandinsky was traveling across Europe, and he ultimately settled in Murnau, Germany, where he produced painting like the one at the start of this post. Fauvism and post-impressionism are clearly exerting there influence, and Kandinsky fell in with the German expressionists who were busily re-defining art. 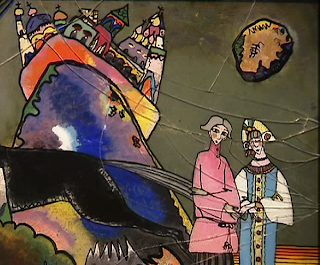 The charming image above is a great example of Kandinsky cross-over art: expressionism meets Russian folk art. By coincidence, a nearly identical study for the same picture sold at Christie's for over 21 million dollars the day before I was in Brussels (below). These works were painted in 1909, and at that time Kandinsky began using the term Improvisation to name his paintings. He borrowed in from music, which was an important inspiration. Kandinsky was a synesthete. He associated colors and shapes with sounds. So, he could see painted images as musical. That is a key to understanding his move towards abstraction. Non-vocal music is abstract. It (often) doesn't represent anything in the world, and this in no way diminishes it's aesthetic interest or value. So, if paintings are like musical works, and music is abstract, then paintings can be abstract too. Representational content become unnecessary. 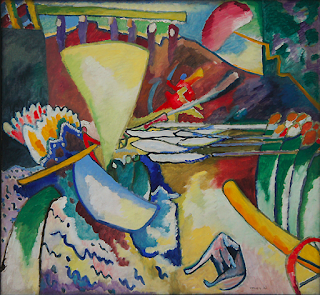 In two marvelous 1909 paintings (above), we can see Kandinsky moving towards abstraction more completely. Though he is not yet there--note the dog in the lower right, for example. It would take another two years before Kandinsky allowed himself to completely abandon representational content. The exhibition does not leave views trapped in pre-abstraction limbo, of course. It includes many abstractions, including his "Painting with a White Circle," from 1911 (above), which rarely leaves its home in Tibilsi. Kandinsky considers this ghastly and imbalanced canvas his first truly abstract work. More appealing is the the black spot painting above. Having been primed by the earlier folk paintings, it is hard no to see this one as a village scene. The horizontal black line towards the bottom can be interpreted as the horizon, with buildings on the left, a mountain on the right, and a yellow sun hovering above that. The rest is a kind of Rorschach test to be reinvented by each viewer. 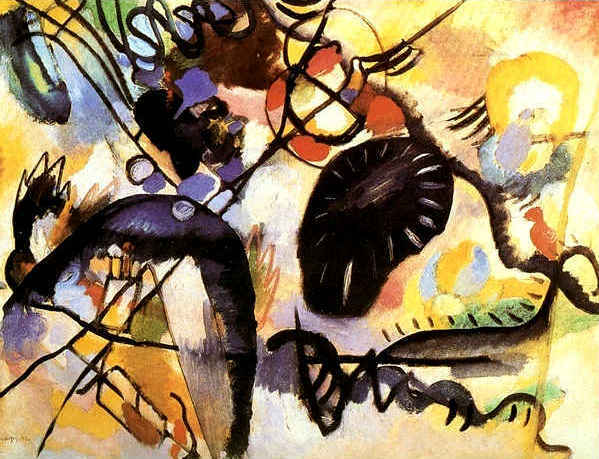 Interestingly, Kandinsky did not abandon representation after his move to pure abstraction. He even returned to folk painting from time to time. The show includes a series of paintings of glass (see detail above) that look like typical Kandinsky abstractions if you squint, but look more like kitschy outsider art when viewed normally. The use of glass also reminds one of Duchamp's Bride Stripped Bare, and like that masterpeice, Kandinsky's glassworks happen to be cracked. The irony here is that Duchamp's use of glass was intended as a leap forward beyond traditional painting and sculpture and into the brave new world of conceptual art, whereas for Kandinsky, painting on glass serves as another indication that the heralded modernist was really a recidivist operating at the intersection between art and craft. 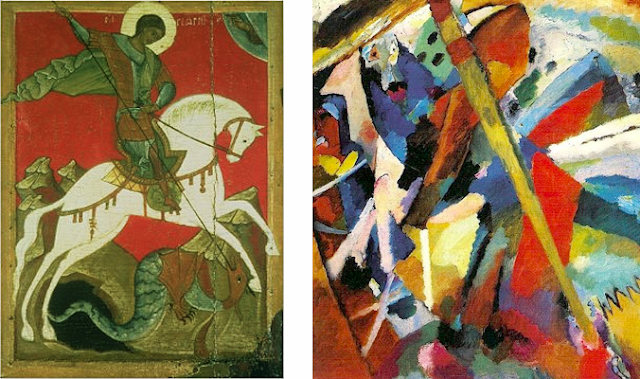 The show's strongest visual arguments for its core thesis that Kandisnky was heavily influenced by traditional Russian art consists in the pair of painting above. On the left, we see a classic iconic depiction of St. George killing the dragon. The right looks like a case of pure abstraction. The title? St. George! Suddenly the yellow streak becomes a lance or spear, the orange form becomes a knight, and the blue becomes a horse, with black hind legs. It's a lovely case of top-down perception, were knowledge can transform what we see. 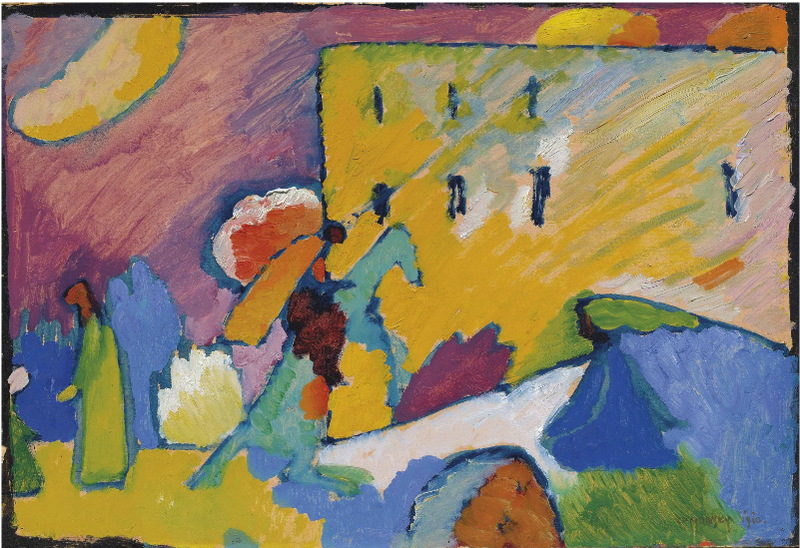 The exercise reveal Kandinsky to be less of an abstract painter than he is often to be, and more of a folk artist who distilled the images of his early life and transformed them into musical improvisations of color and form. In this light, we can revisit the textbook claim that Kandinsky was the first modernist artist to create pure abstractions. That thesis can be challenge on many grounds, and there is now clear evidence that he was beat out by an unsung Swedish artist, Hilma af Klint, who was making abstract modernist paintings as early as 1906, when Kandinsky was still making folksy woodcuts. It's tempting to say that Kandinsky was never an abstract painter, and perhaps never fully a modernist. 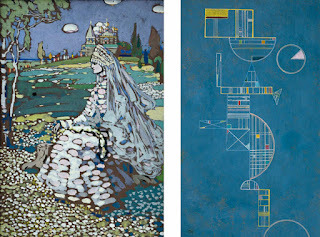 Even his most geometric works, like the "Flowering" from 1930 (above right), resemble his folk images, like the "Bride" from 1903 (above left)--a juxtaposition not on display in Brussels. The bride theme again brings Duchamp to mind, and it tempting to see the geometric abstraction on the left as continuous with the mechanical elements in Duchamp's Bride Stripped Bare. But the contrast may be greater than the similarities. 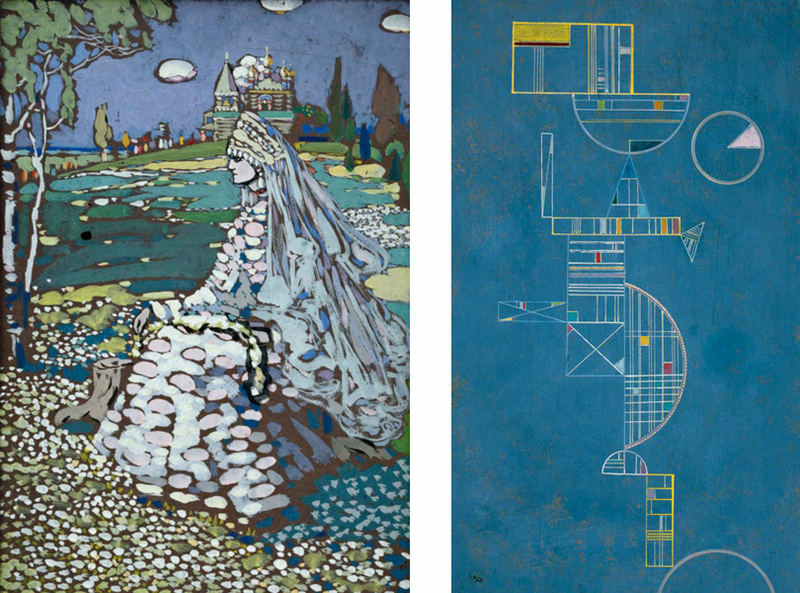 Where as Duchamp is poking fun at abstraction, at aestheticism, and at romance, Kandinsky is exemplifying all these things. His strides forward in art turn out to be nostalgic glances backward. The exhibition in Brussels does a great service by presenting the artist's Russian roots, and we are left wondering whether he ever really left Russian behind. Just returned from Istanbul, where artbouillon visited Taksim Square and the adjoining Gezi Park, cites of a major protest against the government of Prime Minister Tayyip Edorgan in Turkey. The protest began when Erdogan announced plans to converted this area (some of the only greenery in central Istanbul) into a complex that would include a shopping center, a mosque, and building paying tribute to the historic triumphs of the Ottomans. Protestors occupied the park as demolition began, and then police tried to forcibly remove them with tear gas, water canons, and mass arrests. This led to riots throughout the country. Thousands took back Taksim and Gezi, where they remain, celebrating all night. There has been extensive political vandalism and, amidst all that, some striking spontaneous art, both intentional and inadvertent. The painted wheels on the overturned car above, go beyond political messages, and turn this remnant of violence into an objet d'art. 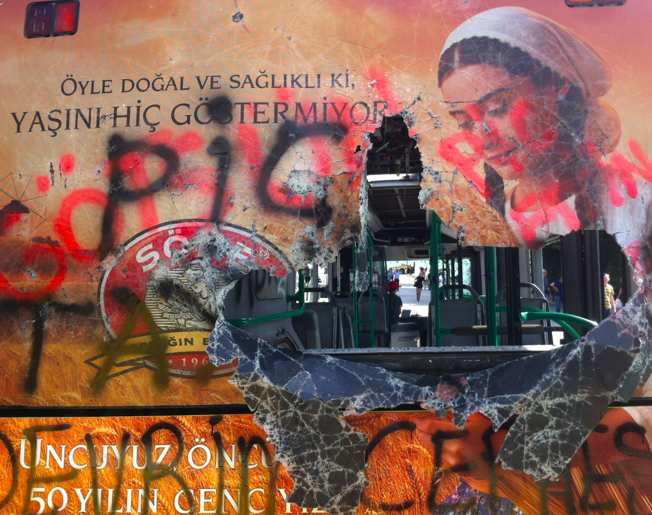 Several buses have also been vandalized, and used as barricades to slow down police should they try to assault the occupiers again. Graffiti-covered and gutted, these have become interactive installations, which any one can enter. The back of one has an advertisement that has been shattered in what amounts an an anti-capitalist version of pop art. 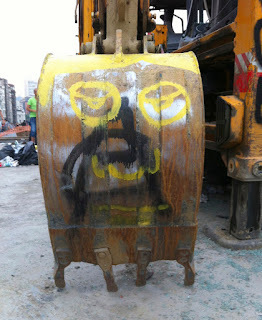 More overtly anti-capitalist are several ATM machines that have been painted and rendered dysfunctional. This one has an ugly color scheme, but the neon hues add irony to what is otherwise an anti-aesthetic act of defilement and defiance. Bricks are also everywhere. Brick paves streets have been dug up in some places to use as supplies for making barricades. The strewn remains of those efforts create interesting patterns, like a Carl Andre piece after a storm. In addition to cars and buses, some work vehicles have been vandalized. Some of these were used to start the park demolition and were commandeered by protestors. Their enormous iron shovels have been transformed into urban polychrome sculptures. All these examples come from Gezi and Taksim, but there are also interesting examples of vandal art throughout the city. Farther afield, the sublimely enhanced construction sign below was close to the Blue Mosque, one of Istanbul's most famous sites, in a more conservative part of the city. I'm not sure whether these enhancements antedate the events at Gezi. The Gezi protestors often use images of Atatürk, the leader who modernized Turkey. Flags, posters, and t-shirts with his image abound. Ironically Atatürk is also used as a symbol by Erdogan. Both sides claim to be he heirs to his vision of a progressive, powerful, and secular nation. 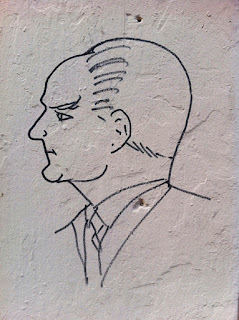 Images of Atatürk can also be found in the streets. 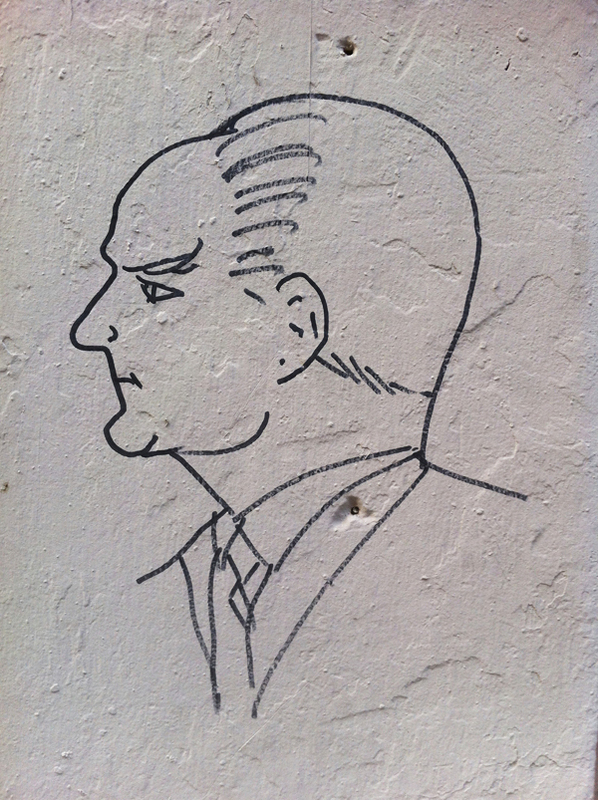 This portrait, on a street that leads to Taksim, shows him as a mature statesman. Best of all was this double portrait, showing Atatürk in his military days, set against a minimalist background. Appropriate because there are many Atatürks in Turkish public discourse--hero to many sides, each version corresponds to a different conception of how the past indicates a path to the future. The Japan Society is in the final week of its exhibition, Edo Pop, which explores in the influence of ukiyo-e prints on contemporary art. The show was co-currated by the Minneapolis Institute of Arts, and the classic prints on display are borrowed from its impressive holdings. In addition, there are works by ten contemporary artists, from Japan, England, Scotland, the United States, and even a Belgium-based artist from Guadeloupe. The juxtapositions are inevitably unfair to these contemporaries, since the older prints are often so spectacular that their latter day heirs cannot compare. 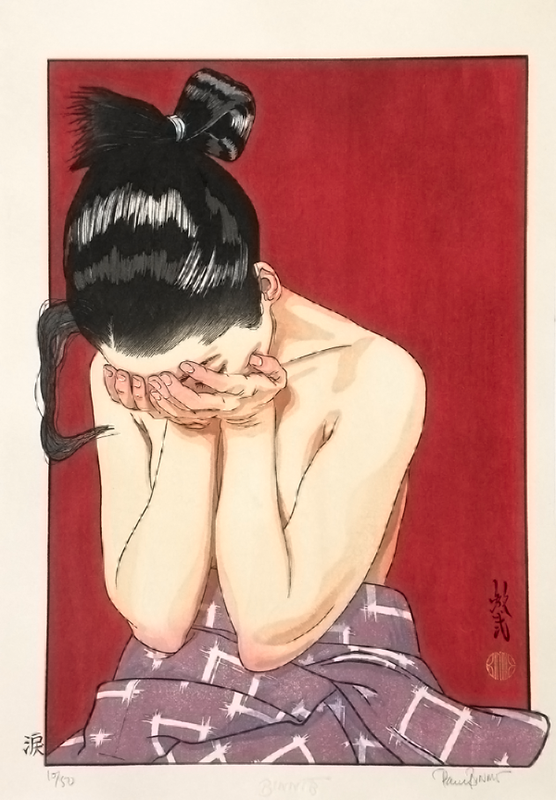 Still, it is exciting to see the enduring influence of ukiyo-e and it is refreshing to see contemporary artists who draw on Japanese sources without taking their cues from anime and modern manga. 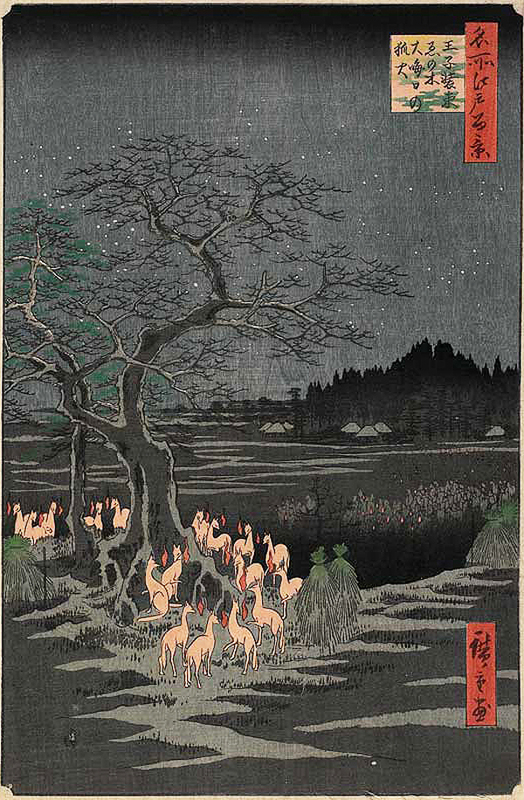 The term ukiyo-e means images of a floating world. Originating in the 17th century, these prints were mass produced for ordinary consumers, and they depicted the theater personalities, courtesans, mythic tales, landscapes, and the vicissitudes of daily life. Edo Pop focuses on the final phase of ukiyo-e production, in the 19th century. 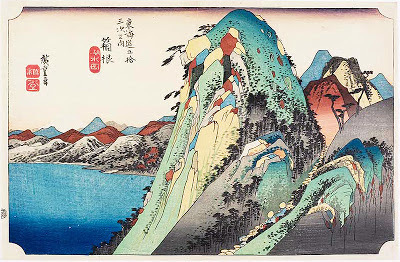 The most impressive works are by Hokusai and Hiroshige. Hiroshige owes a debt to Hokusai, whose work is said to have prompted his own pursuit of art. 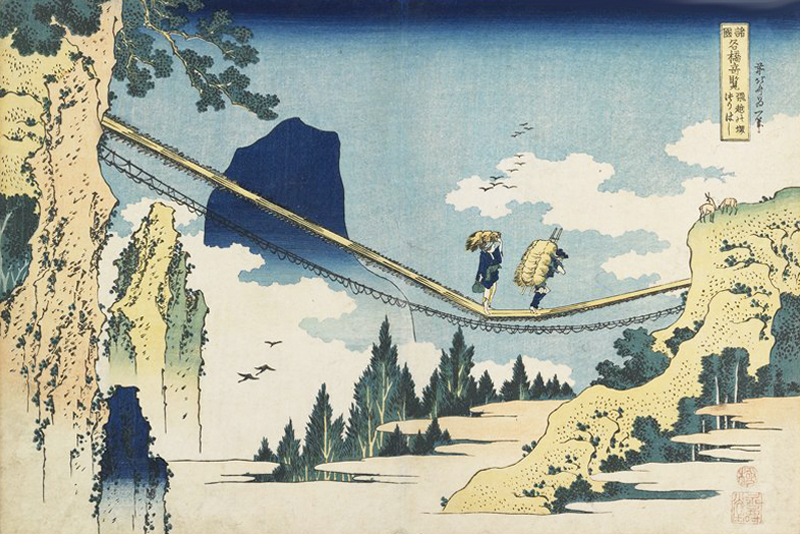 A gorgeous Hokusai, in yellow and blue, is shown above. The show is not thematically unified, though several motifs recur. 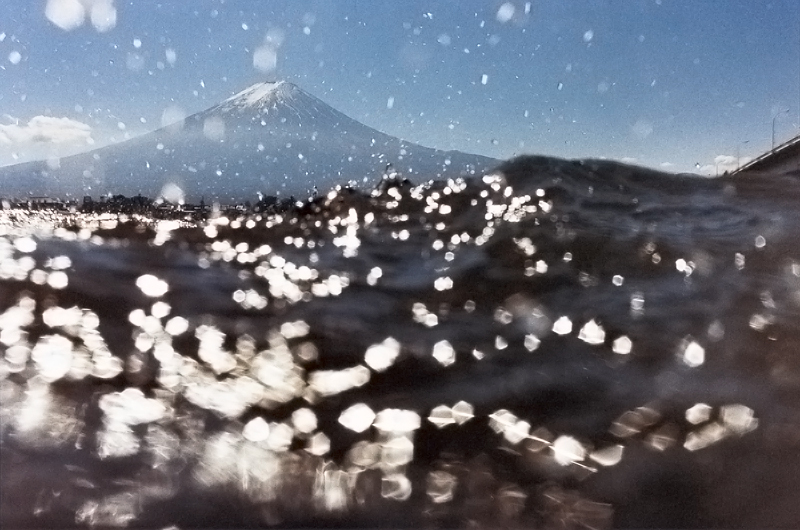 Among the nature pictures, we see the compulsory Hokusai waves and (above) views of Mount Fuji. An even more striking, technicolor mountain by Hiroshige is shown below. 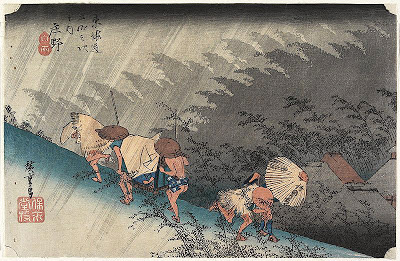 There are also some striking efforts to depict the rain by Hiroshige. The best of these has a rhythmic echoing of form that anticipates futurists, like Balla. In addition, there are images of birds, tigers, and other creatures. 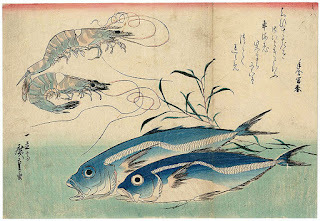 I was especially drawn to two fish prints, one by Hiroshige and and another by Kuniyoshi. 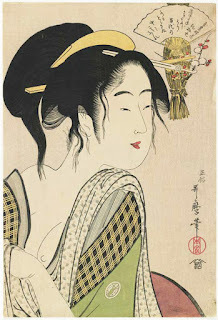 Both were students of Utagawa Toyokuni, as was Kunisada, whose work is also on display. They all took on the surname Utagawa, which can cause some confusion. The exhibit also includes the usual host of actors, courtesans, geisha, and beautiful people ("bijniga"). There are is even a female impersonator and a male prostitute. Images of actors and courtesans were banned in the mid 19th century, along with the Tenpo economic reforms. 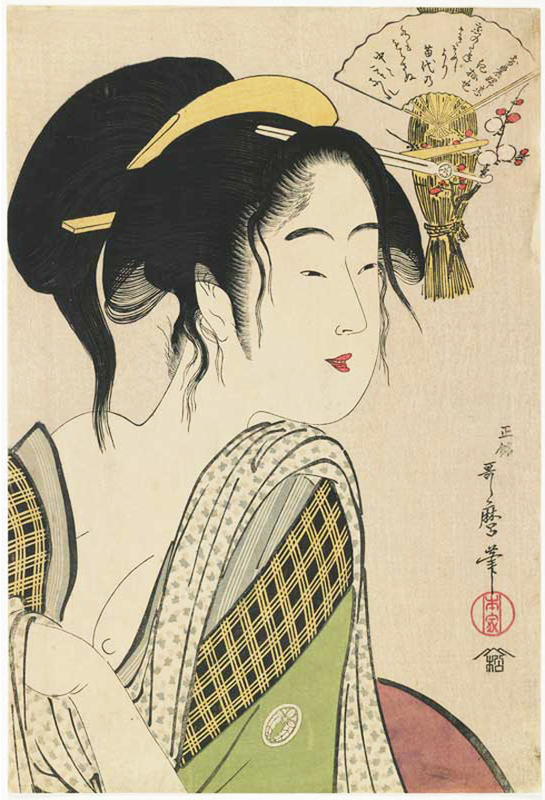 Forty years earlier, Utamaro, created the image below, called Love for a Farmer's Wife. Utamaro was famed for his bijinga images, as well as his womanizing, as suggested by Mizoguchi's film Five Women Around Utamaro. Some of the prints in the show have supernatural themes. Here is a demon by Hokusai, and a group of supernatural foxes gathering by a shrine at New Year's emitting small red flames. 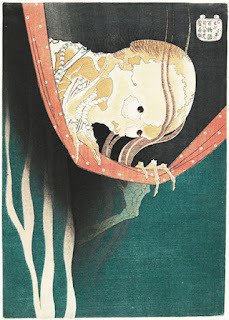 There is an amusing Hokusai showing a worm-like spirit, whose body consists of dinner plates woven together by hair. 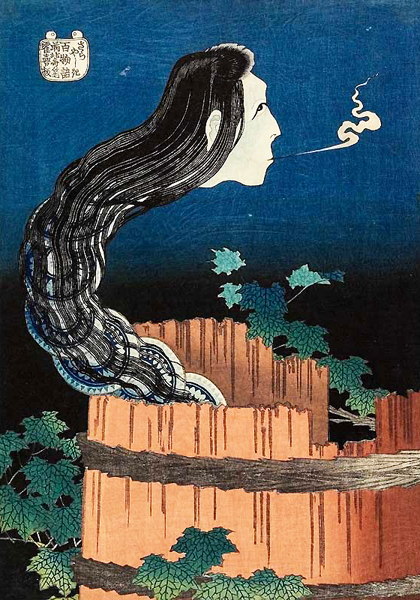 Apparently this depicts the legend of a servant who became a ghost after being thrown into a well for breaking a precious piece of china. 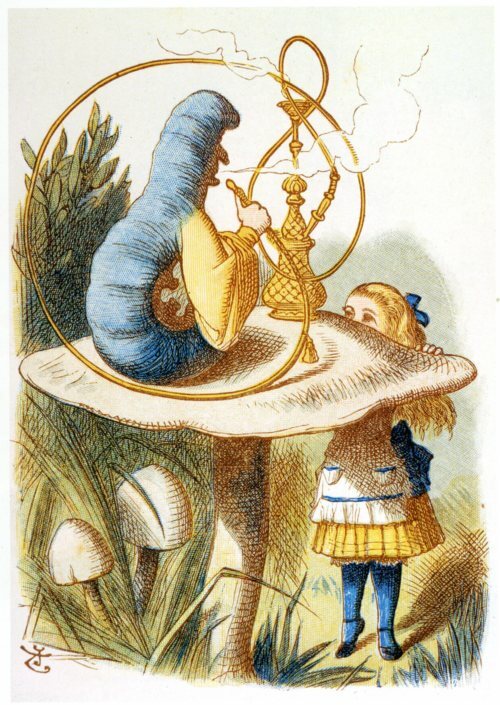 The image is remarkably reminiscent the smoking caterpillar in Alice's Adventure's in Wonderland. 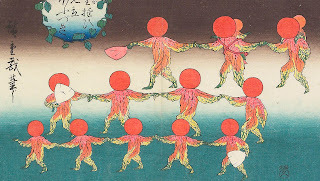 Other curious include a image by Hokusai of dancing children dressed too look like vegetation, and some instructions for making shadow puppets by Hiroshige. 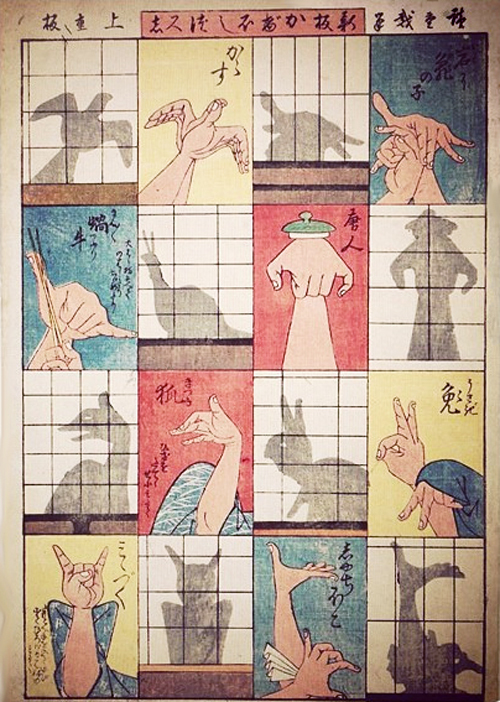 Such images show the diversity and invention of traditional ukiyo-e prints. 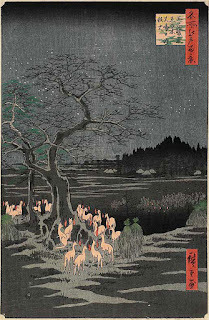 Sadly, the tradition died out in the 19th century, though it was occasionally revisited in the 20th century by artists such as Ito Shinsui and Hasui Kawase. Edo Pop does not include these figures. It jumps ahead to the present, and presents an impressive range recent of ukiyo-e inspirations. Most orthodox in technique is Masami Teroka, who has been making prints using traditional methods for decades. At a quick glance, these might be mistaken for old prints, but a closer glance reveals modern themes. One shows a tattooed woman slurping noodles in the foreground, while a geisha clutches a McDonalds hamburger in the background. 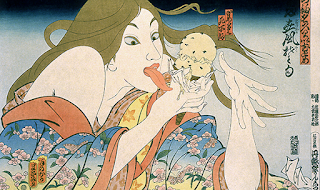 Another shows a kimono clad maiden licking ice cream. Other artists depart from the ukiyo-e aesthetic a bit more: A Brooklyn-based Japanese tattoo artist, named Aiko designed the entry art for the show (top); a Scott named Paul Binnie makes prints, like the weeping woman below, that are true hybrids between Western and Eastern styles; Narahashi Asko, of Tokyo, took the below seascape photo, which pays homage to Hokusai's Fuji prints. There are other works in mixed media, paint, and a series of computer generated images, by London's Emily Allchurch, printed on glowing lightboxes. These artists are drawing on ukiyo-e in inventive ways, and their presence in the exhibition serves as a reminder that great traditions in art need never die. The greatest gift of Edo Pop, however, is the Edo side, rather than the Pop side. The classic prints are often reproduced, but seeing them up close is a special thrill. The prints were made as mass art, and, to that extent disposable, but their value is certainly enduring. Indeed, the best of these printmakers stand up to the best painters of Europe. 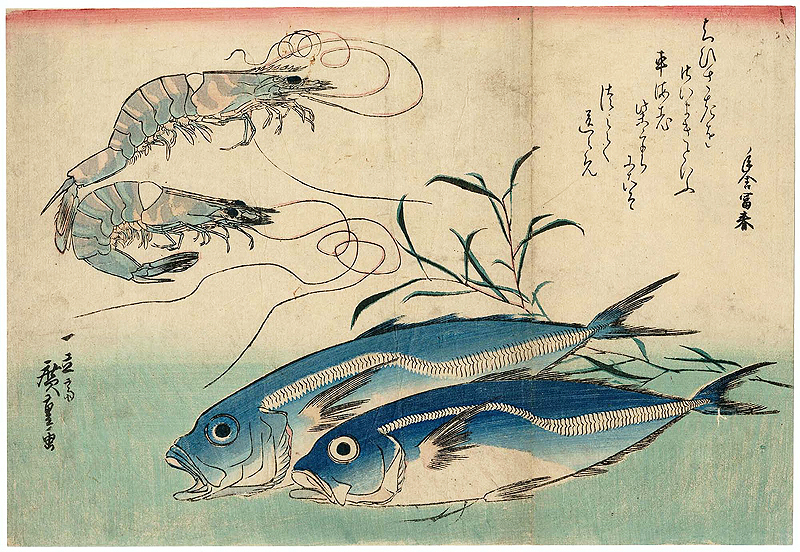 Hokusai's sense of color, line, and design is unsurpassed in the history of art.